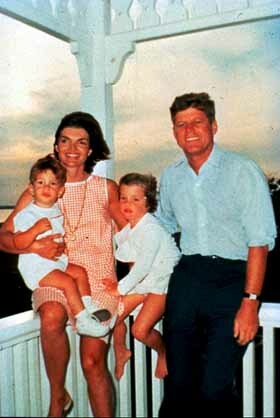 there" experience that recreates the world of the Kennedy White House years. Trail exhibit. Visitors then "attend" the inauguration of the 35th President by watching Kennedy deliver his challenging Inaugural Address. 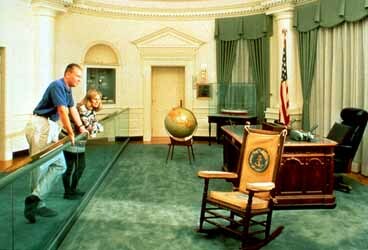 All exhibits on the Kennedy presidency, including such issues as the Cuban Missile Crisis, Civil Rights and the Space Program are housed in spaces that reflect the decoration of the presidential mansion. The work of Attorney General Robert F. Kennedy is documented in a room suggesting his Justice Department office. of the White House in 1962. 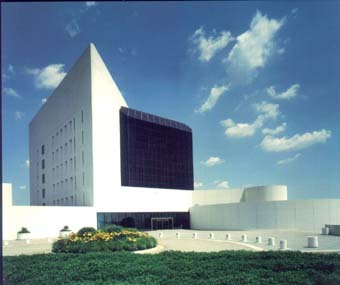 Your experience at the museum concludes with a visit to the Legacy exhibit, where you can discover how world governments honored the memory of President Kennedy. The exhibit, among many other things, shows how John Kennedy inspired many young people to participate in politics and public service. President Bill Clinton recounts his brief visit to the Kennedy White House as a teenager in 1963,and how this visit influenced his life and impacted the nation some 30 years later. area created for reflection and inspiration. 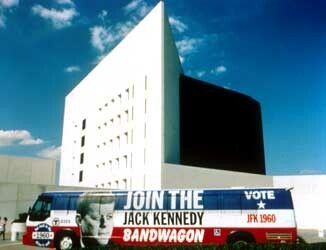 The Kennedy Library is the only presidential library in New England and one of ten in the United States. For more information on tours and visits call visitors services at 1-877-616-4599.